MELANEE SHALE: Venofye Under-Eye Skin Care Review! Impressive Results! Venofye Under-Eye Skin Care Review! Impressive Results! Anti-aging skincare has been my #1 top beauty priority since hitting my mid 30’s. I never took my skincare routine seriously in my 20’s as I have always been told how young I look. I inherited my mom’s amazing Asian genes where looking young forever is a familiar thing. However, I recently started to notice the dark circles under my eyes have gotten worse and I realized I couldn’t take my younger looking skin for granted anymore since I am no longer in my 20s. I had heard time and time again; preventative anti-aging skincare is a must. Now I see why! 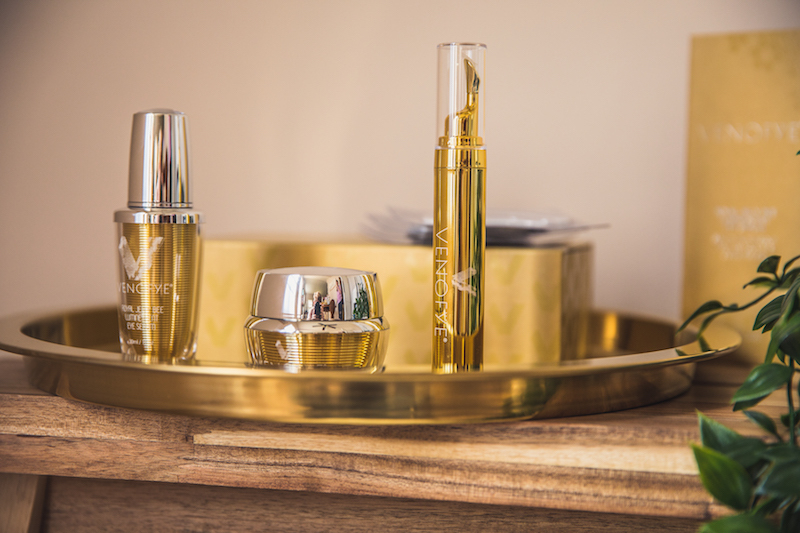 I was recently introduced to Venofye and heard many great things about their Royal Jelly Bee Eye Collection. Let’s just say I’m not only hooked on the entire collection but I’m also in love with the beautiful gold packaging! Keep on reading below to learn more about the brand, the products used, my daily process and the results. Excited to share this experience with you all today. Venofye has emerged as one of the hottest new brands in the world of anti-aging skin care. What they found was that venom is considered to be one of the best anti-aging solutions. Venofye products pair the best of both worlds by introducing you to the beautifying benefits of venom and partnering it with high quality skin care ingredients that have found a place in skin care regimens for decades such as green tea, collagen and vitamin A. Most of us are guilty of being satisfied with good skincare, but excellence isn’t too far away with Venofye. They help you by introducing you to a range of products that allow you to revitalize the look and feel of your skin. The Royal Jelly Bee Eye Collection consists of an eye firming cream, eye serum, eye beelift and a rejuvenating mask. 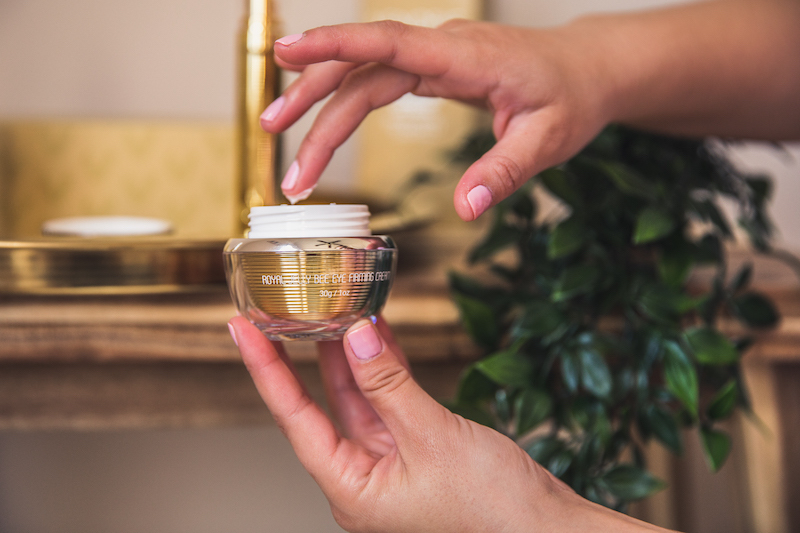 The Royal Jelly Bee Eye Firming Cream is formulated with caffeine, Shea butter, vitamin E and green tea to energize the skin under your eyes and diminish the look of puffiness and fine lines. Achieve the fresh, well-rested look everyone wants with this remarkable cream. 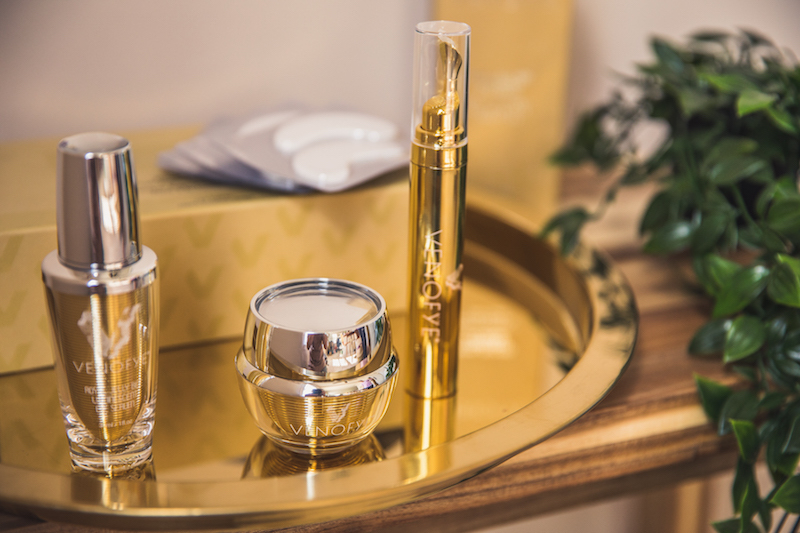 The Royal Jelly Bee Luminescent Eye Serum is designed to reduce the appearance of fine lines and wrinkles surrounding the eye area. 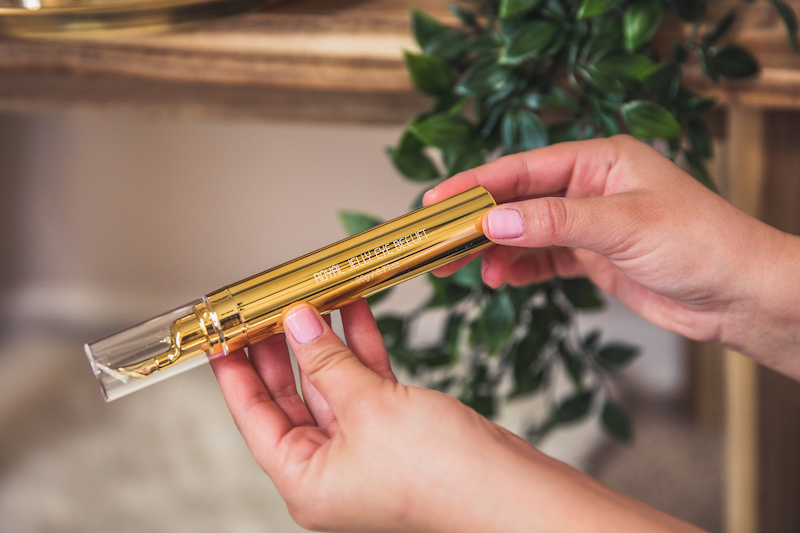 Rich, yet quickly absorbed, this eye serum was formulated with Bee Venom, Palmitoyl Oligopeptide and Vitamin C to help reduce the signs of aging. Venofye’s most powerful eye treatment can erase the appearance of puffiness using our innovative applicator. The Royal Jelly BeeLift was inspired by state-of-the-art technologies in lifting procedures. 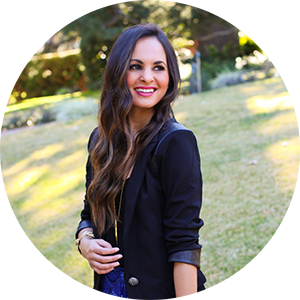 This wakes up tired eyes for a youthful glow that is amazing. 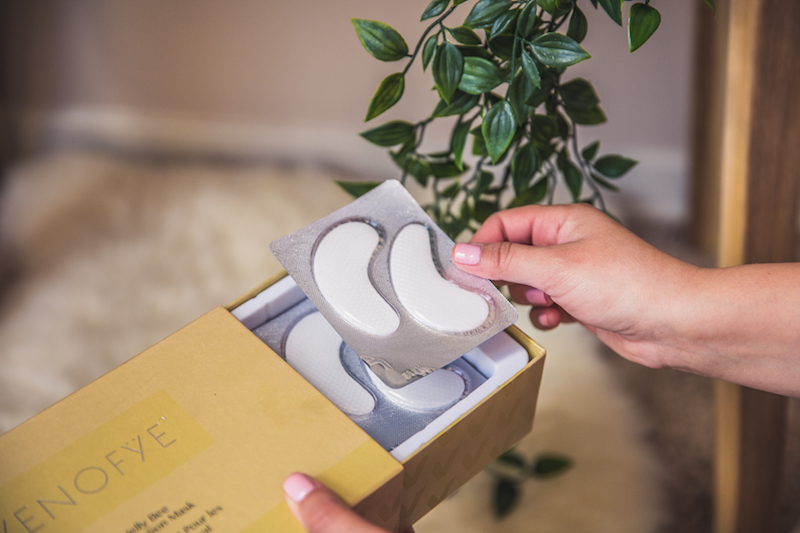 I began using the Royal Bee Eye Collection about two weeks ago and have found that the process was easily added to my daily skincare routine. Royal Jelly Bee Eye Firming Cream- Used both morning and night to help me with puffiness and to look fresh every morning. Royal Bee Eye Serum- Twice a day to help fight wrinkles that may be forming. Royal Jelly Eye Beelift- I used it only at night to help receive a youthful glow by the morning. Royal Jelly Bee Rejuvenation Mask- I used it twice in the past two weeks when I felt I needed to fight fatigue on my face. I tend to eat salty foods and drink wine on the weekends and noticed that I wake up with my face puffier and exhausted. I put the mask on for 10-15 minutes and it helped tremendously! The best part about the entire eye collection is that it’s for all skin types and doesn’t irritate the area around your eyes. I tend to have very sensitive, dry skin and it hasn’t affected my skin once. The eye cream is also not too sticky and heavy so it leaves my skin smooth and hydrated. I’m extremely happy with the results after using it for the past two weeks! I’ve noticed my dark circles have lightened up quite a bit. Even though my face tends to still get puffy and tired quite a lot, the Royal Jelly Bee Eye Collection is a savior! I also noticed that I can walk out of my house with no makeup on and feel confident about my skin. My boyfriend took a picture of me with no makeup on just the other day and I was shocked how great my skin looked! My eyes weren’t puffy at all and he even said wow babe, your dark circles are a lot lighter. If he noticed my skin improvements, then it must be true haha! I’m going to continue using the eye collection and will share more results down the road. I’m confident that my skin will only get better from here. Also make sure to check out their Instagram page HERE as well as their Facebook page HERE. Would love to hear your results if you do give it a go. Make sure to comment below! This is a sponsored conversation written by me on behalf of Venofye. The opinions and text are all mine.